In January 2010, at the age of 12 years, Tyler started to suffer from severe headaches and sickness every night. He was diagnosed with migraines but it soon became apparent it was something more serious. A scan revealed he had a brain tumour and he was immediately transferred to the Children’s Neuro Ward in Southampton Hospital. The next day he had an operation to remove as much as possible of the tumour. Unfortunately it wasn’t possible to remove it all. Tyler spent several weeks in hospital and had 7 operations that left him in a wheelchair, visually impaired and with severe nausea issues. Steroids resulted in him gaining a lot of weight. Over the following months Tyler fought to regain his fitness through physio and hydro therapy. He worked hard to lose weight and regain some mobility. He did this with a lot of courage and determination. After treatment at Moorfields Eye Hospital, in London he had to accept that the damage to his eyes was permanent. This was a period of watch and wait as the situation stabilised for a while. Unfortunately Tyler’s next 2 scans showed the tumour was growing again and further treatment was essential. 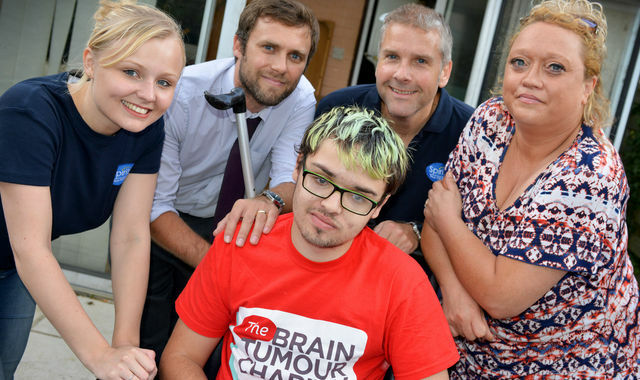 In January 2014 Tyler underwent radiotherapy for 6 weeks. In January 2016 Tyler had a bleed from the tumour which left him with worsened vision and mobility. He was again having physio but becoming more and more tired. A scan in July revealed the tumour was again growing and the only option was complete removal. In October Tyler had an 8 hour operation followed by 3 further operations after complications developed. He has now had 26 operations, and spent over a year combined in hospital. His sight and mobility are now permanently damaged, and still has a long road ahead of him but he never complains. He struggles to get up the stairs in the house to get to his bedroom, and use the bathroom. We need to get these on the ground floor of the house for him, not least of all to remove the risk of him falling down the stairs. 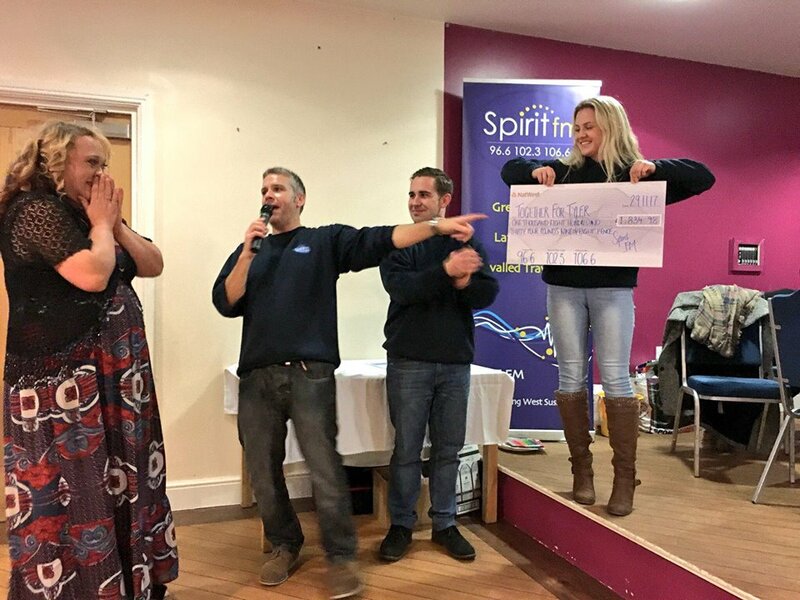 As many of you know we found out just before Christmas that we potentially need to raise an extra £10,000. To say that this was upsetting would be an understatement . However having licked our wounds it is onward and upwards. It has also inspired me to undertake a personal challenge , one which literally scares the socks off me. I am going to take part in the Littlehampton leap, which involves jumping from a bridge into the river Arun. I am terrified of heights and am sure that the water wont be too warm either . But this is my personal challenge to help Tyler. However I wont be the only one there helping him. 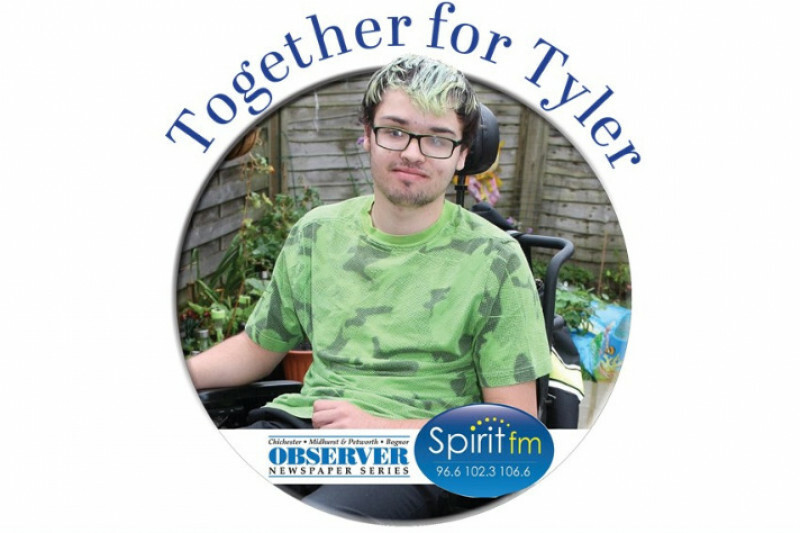 On team Tyler there will be Stuart McGinley, Sally Austin, and Anna from Spirit FM, Stepehn Pickthall from the Observor and some other mad and amazing volunteers. Team Tyler will be dressed in green, there are also some spaces left if you would like to join us. If not how about popping along and giving us a cheer and maybe a bit of sponsorship?! My sister actually went dry for January !!!!! for those of you who know her you will understand the pain she went through , she is also raising funds for Tyler .